Today’s Pedal Line Friday submission is from Max Van Mantgem. If you have a pedal line (doesn’t have to be in a board) for your rig, please email me a photo, bio, description of pedals and routing to pedalline@nulleffectsbay.com. Every Friday I’ll showcase a pedal line submission. Make sure you include any links to your band or music page. Hi, I’m Matt, but a lot of people call me Max. So, I’m a hobby guitar player, at this stage in my life, so I’m not trying to promote anything other than great pedals. So, this is my latest board, and I think my best board. I currently own about 70 pedals, from nearly priceless vintage pieces to cheaply purchased pedals from ebay, so each pedal on here represents a choice. Onespots feeding Moen daisy chains with ferrite for noise reduction. Guitars run the gamut from a modded Stagg tele copy, to an Epiphone SG – I’m a lefty, so I usually go with either an SX Liquid or a Harley Benton Les Paul copy. So, starting from the lower right- we start with a Hotone Octa to a custom pre-amp modeled after a “grey spec” DOD 250 made by Andrew at Acorn Amps named after me- Max. From there, we go to a Mooer Hustle drive – It’s an OCD clone, but I actually prefer it to my OCD, because it sounds just a little more crisp and open, less compressed. That goes into a Walrus Audio Iron Horse distortion which goes to a Digitech Digiverb, used only for the “backwards” setting. 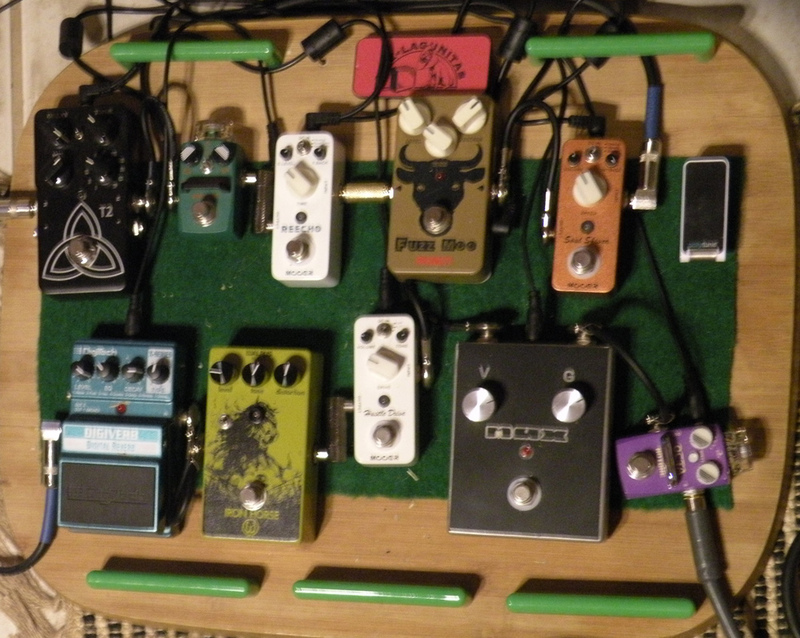 On the upper row, starting from the right- we have a TC Electronic Polytune Clip which while not technically a pedal, is great for affecting my tone by keeping me in tune. So, next in the chain is a Mooer Soul Shiver that shows that one man’s limitation is another man’s choice- it’s a chorus/vibe/Leslie that really sounds either like a vibe-y chorus, or a chorus-y vibe. Fortunately for me, that’s all I want for modulation. That goes into a Moen Fuzz Moo which has to be the smoothest muff-style fuzz I have ever heard.That goes into a Mooer Reecho which goes into a Hotone Tape Eko which goes to a TC Electronic T2 Trinity reverb. For Amps, I’ll plug this into either a Vox AC15 or a Vox Valvetronix VT30,when I need to be quiet. I realize I need a new buffer though, so off to ebay with me!